How Smart Could I Make My Dumb Manhattan Apartment? Jack Borenstein, President of Ultimate Sound and Installations, Inc. in the showroom of Crestron Electronics. SOMEBODY in my apartment is not very smart, and since I live alone, it is obviously the machines. Here is how clueless they are: If I hit the remote for the Bose CD player in the living room, the Bose iPod dock 10 feet away turns itself on. The DVD player, VCR and cable all have their own remotes, which refuse to communicate with one another. The radiator and air-conditioning units must be adjusted with a lever, and they have only three settings: Comfortable, until you get into bed; Too Hot or Too Cold, as you are falling asleep; and Shoveling Coal on the Titanic, at 3 in the morning. And while I have never left the house with the gas on — a fear that apparently is passed down genetically — I worry, as I grow older, that this might happen. 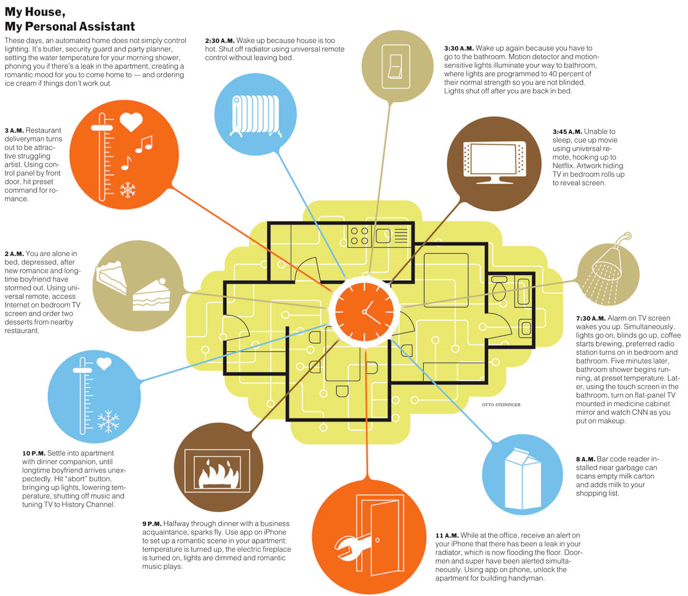 There have been lots of articles about smart homes, but few that apply to someone who lives in a 970-square-foot, one-bedroom apartment in New York City. Computer-activated radiant heating to melt snow on the driveway? I don’t have a driveway. A system that checks the weather report and, learning that rain is predicted, turns off the sprinkler system? I don’t have a lawn. A foolproof late-night security system? That would be the doorman, and his name is Freddy. But there are certainly things in my apartment that could be smarter. And so, after a talk with a representative of the Custom Electronic Design and Installation Association, I consult the group’s Web site (cedia.net) to find a local expert. I am curious about what is available at three price points: $2,500 or less, $7,500 and You Just Won the Lottery. I identify myself to all the experts as a reporter and tell them that my mission is strictly theoretical. But the firm has no minimum fee, does not charge for consultations and often does small apartments. Mr. Borenstein is confident that I can smarten up my place for $7,500. Crestron, a well-known home automation company, has introduced a pared-down wireless integration system, he says, and he is offering 10 percent off its products. Still, $7,500 is very different from the sky’s the limit, and when Mr. Borenstein and Anthony Benjamin, one of his system installers, visit my apartment, it soon becomes clear that some features are out of my reach. Motorized blackout shades — which Mr. Borenstein estimates would cost a minimum of $1,000 for each window, plus installation fees — are scrapped. Retrofitting the radiators so they can be controlled by remote, which Mr. Borenstein has never done, is not an option, either. I had a similar problem years ago: an overflowing radiator pan, which the couple to whom I had sublet the apartment didn’t notice until the ceiling below was raining and the neighbors pounded on their door. Mr. Borenstein would prevent such a deluge by installing a small flood detector as part of a security system that would also include smoke detection. Mr. Borenstein and Mr. Benjamin suggested replacing my light switches with a smart dimmer that could be controlled by remote, and investing in a Blu-ray player. Their system would play audio from a variety of sources — FM, satellite radio and whatever music was stored on my computer — and could be controlled from outside the apartment, with an iPhone, using the Crestron Mobile Pro App. Because I am now on a budget, we lose a lot of the audio-video elements, including the speakers and control panels in the bathroom and kitchen and the TV in the bedroom. With the computer brains in place, those features could easily be added later, Mr. Borenstein says, at a small additional cost. Installing a wireless keypad and two Yamaha speakers in the bathroom, for instance, would be about $850. The whole system, including the Crestron Mobile Pro App, which is $99 and has to be bought directly from Apple, comes to $8,485. And that doesn’t include the monthly fee ($49) paid to a security monitoring service. From Prudential Douglas Elliman Real Estate's "The Hudis Report," Oct/Nov 2007. From Prudential Douglas Elliman Real Estate's "The Hudis Report," May 2009. In this case, Lee Harris of PMA, the architect, specified Lutron lighting. Borenstein knew that Harris really wanted the Lutron keypad on the wall, but he probably wouldn’t want the control system in the background, as it required large power boosters, and the space was not big enough to accommodate the power boosters. Architects never want to give up space. In this way, Crestron seamlessly controlled all the lights and fans in the 7,500-square-foot residence. “We wouldn’t have considered doing this with anyone other than Crestron,” Borenstein states. “I wouldn’t trust anyone but Crestron.” Similarly, Ultimate Sound worked together with “the HVAC guys” to integrated the climate control system. The fully integrated system was engineered to work from any touchpanel, laptop or remotely via e-Control. Once, the wife was at home and called her husband on his cell phone to complain that the apartment was too cold. He was able to adjust the temperature remotely from his laptop while flying in his private jet at 40,000 feet. While “the HVAC guys” used Crestron thermostats in the past, they hadn’t seen them work with e-Control, and they were very impressed. The HVAC installers now purchase Crestron thermostats through Ultimate Sound, and they recommend Ultimate Sound to new clients. The key to working successfully with HVAC installers, according to Borenstein, is to “make sure you give them the thermostats to install and fully test before you connect to the system.” While it is certainly tempting to simply give a consultant or architect exactly what is specified and take the path of least resistance to complete a job, Ultimate Sound made the extra effort to stand by its partners and provide the best solution for the client. Says Borenstein, “We feel Crestron is our family. 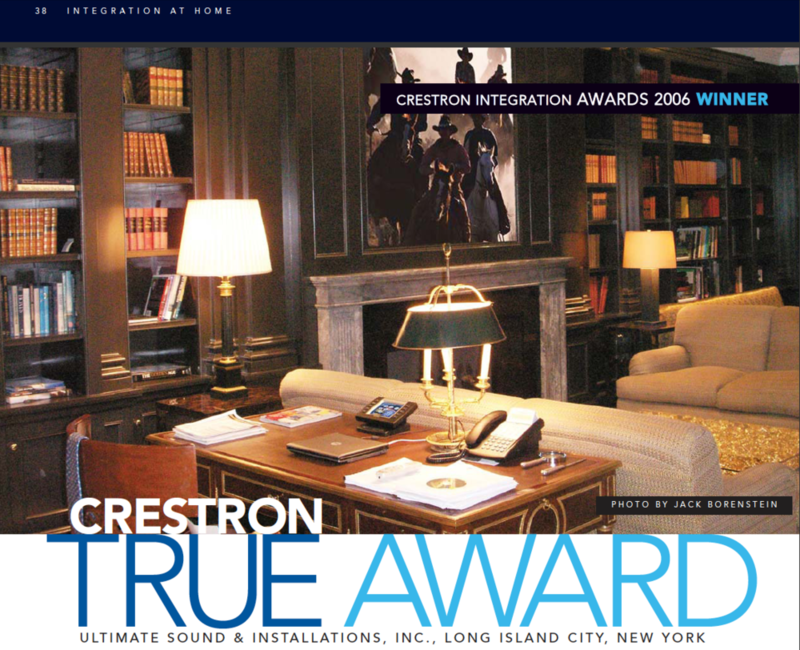 They stand behind us and we stand behind them.” Ultimate Sound wins the Crestron True Award for its loyalty, dedication, and professionalism. Most kitchen appliances are all about food: storing it, cooking it, and cleaning up after it's eaten. Except for the television. But even though it fails miserably at food prep, the TV has become as common in the kitchen as any power mixer or espresso maker. "You're no more surprised to see a TV in a kitchen than a microwave," says McKee Patterson, partner at the Connecticut architectural firm Austin Patterson Disston. "It's just not a big deal anymore." In the past, TVs were too big and clunky to fit comfortably in all but the largest of kitchens. But with the advent of flat plasma and LCD screens, you no longer have to give up valuable countertop real estate. In fact, screens have become so slim — some are just 2 to 4 inches deep — that they can go nearly anywhere. Meanwhile, falling prices have virtually eliminated cost from the equation. "A small LCD TV is about $500. These days, anyone can have one," says Jack Borenstein, president of Ultimate Sound and Installations in New York. While it's easier than ever to squeeze in a TV, there are still some design considerations to take into account. First, since the screens tend to be smaller than those elsewhere in the house, viewing distance is critical. "You have to locate it close enough for people to see it and have easy access to it," says Barbara Laughton, vice president of Front Row Kitchens in Connecticut. Small screens — say 15 inches or less — are best mounted underneath cabinets or at the end of a counter. Larger screens can be hung on the wall or recessed into cabinetry. Also, think up-front about who will be watching. If it's the cook, then the screen needs to be within view of the kitchen work triangle (sink, stove, and fridge). If it's the kids, then the TV should be oriented toward the breakfast bar, dining table, or other seating area. Swing arms that attach to the wall or cabinet or pull-out swivel trays help expand the options for kitchens with multiple viewing areas. Finally, ask yourself just how important the kitchen TV is compared with others in the house. If you or your family members plan on spending a lot of time in front of it, you'll probably want to invest in a larger screen, high-quality built-in speakers, and even a DVD player. Then again, you may not want to look at the TV at all. Another advantage of the new generation of flat-screens is how easy they are to completely hide from view. One of the more innovative ways is to install it behind a picture frame whose artwork retracts for viewing and covers the screen when the set is turned off. A still more customized approach is a mechanized system that allows the television to descend from ceiling panels or rise out of an island. But the most popular method of making the kitchen TV virtually invisible is bracketing a flat screen to the underside of cabinetry, so that it can neatly flip up and out of the way. The TV itself is only the first step, Borenstein points out. There's also the wiring — likely to play an even bigger role as TVs inevitably combine with other functions, such as accessing the Internet. Another commonly overlooked item and necessary evil is the cable box and possibly an infrared repeater system to control the cable box when it’s hidden behind doors. And let’s not forget about the ventilation that the cable box is definitely going to require in addition to being accessible to exchange a defective box or a future upgrade to a new and improved box. When embarking on a kitchen renovation, it may be wise to wire the room for video and data feeds even if kitchen tech isn't your thing. It can make your house more valuable and marketable if you decide to sell. Perhaps one day you’re going to want to hook up your smart kitchen appliances to the internet so, let’s say the supermarket will be emailed that the milk that you scanned it’s barcode into will deliver fresh milk without you lifting a finger before you get grossed out by the smell of bad milk. What about the appliances telling you, or your service provider that it’s time to perform an earlier scheduled maintenance because your water filter will expire in a month or your stove has a gas leak. "You have to think about running and hiding wires — give yourself or a future owner the option," says Borenstein. In situations where rewiring isn't practical, cables can be hidden behind hollow baseboard or crown moldings designed for that purpose. Some manufacturers, including Sharp and Sony, offer wireless TVs, but you still need to hook up a transmitter from a cable box or DVD player elsewhere in the house. And the technology is pricey. As much as some purists might resist it, the kitchen television is here to stay. "It has become an appliance at this point," says Patterson. "Instead of asking clients if they want one, we just ask them where they want it." From an upper floor in a Manhattan skyscraper, the view is breathtaking. Central Park radiates green on a bright summer day, and the blue sky that seemed so far away from street level now hangs just outside the window. The natural and man-made bounty is almost magically reflected in a chorus of sounds that floats in the room from mysteriously invisible sources. The speakers that unleash the music are hidden behind small, silk rectangles in windowsills, valences and across the way in the seamless cabinetry of a bird's-eye maple headboard. But what powers the sounds is in plain sight in one corner: a formidable stack of high-fidelity stereo components arrayed on a custom-made stainless-steel cabinet. This high-tech totem pole is, properly, topped by a sleek television set canted slightly forward for best viewing from the head of the bed that dominates the room. The whole setup is controlled by switches on the arm of the headboard and a custom-programmed remote control. Of course, when it all gets to be too much--the view of Central Park, the crystalline surround-sound, the pixel-perfect laser disc--the folks lying in the bed can flick switches to close the blinds, shut off the stereo and then turn their heads to the left to contemplate the serene Ellsworth Kelly painting on the wall of the sunken living room. To do that, of course, they just need to turn on the lights by the painting from a rheostat in the headboard. With the exception of the view, the sound and light in this sleek, modernist pied-à-terre were orchestrated by Jack Borenstein, the founder of Ultimate Sound and Installations in New York City. The company is a custom installer of all manner of high-technology paraphernalia, including security, telecommunications and lighting systems as well as audio and video equipment. As these systems become linked by wires, cables, infrared sensors and computer chips, they must also be brought under control by careful design and planning, along with thorough lessons for their owners, for whom a dead battery in the remote can cause total dysfunction. Borenstein is part of a growing cadre of fiercely competitive entrepreneurs who have created small operations that are capable of stage managing such installations. At one East Side Manhattan apartment, Jack Borenstein created an installation that is remarkable for the simplicity with which "an unbelievable array of options can be used," he says. Uniformly programmed remote controls can simultaneously access different television, video and music programming in three separate rooms, or "zones" in trade parlance. To provide the much-sought-after surround-sound, whether for opera broadcasts or laser discs, other speakers--at the client's insistence--stand in full view on either side of the set. Two other speakers and a subwoofer are arranged unobtrusively around the room. Because of the artfulness with which these three nondecorative objects have been placed, they are practically invisible. "The room is so rich in detail and warmth, and there are so many things to draw your eye, that we didn't worry about drawing attention to ourselves." The equipment array--surround-sound receiver, amplifiers, video and audiocassette decks, compact-disc and laser-disc players--is smoothly ensconced along one side of a sturdy custom-built bookshelf; the room's principal occupant keeps his humidor on a shelf next to his remote control, which can activate any of the equipment--in this room and the master bedroom, where an infrared sensor provides access to the system's complete CD, laser-disc and video-cassette library as well. Wall-mounted controls operate the four concealed speakers placed throughout the expansive living/dining room. The media installer has to work well in both arenas, making sure his arrangements are at peace with not only the design elements of each room, but also that their physical integration with those elements is as seamless and unobtrusive as possible: it's tough to make a floor-to-ceiling rack of stuff blend in, or to make a 27-inch television feel comfortably part of a room that features lots of leather, wood and fine oil paintings. "That's the most difficult part of a job," says Borenstein. "We wear many hats and work with all the trades." (Those hats fit easily on his head: before starting Ultimate Sound, Borenstein had his own general contracting firm and installed closed-circuit television equipment in hotel rooms and security systems in offices.) "Some architects don't want to see any equipment, or very little," Borenstein explains. "But a good architect or designer will know where he can steal space from to give the audio-video installer room to work." Conflicts between what a designer or decorator envisions and the demands inherent in powerful audio and video equipment, notes Borenstein, often turn out to be rooted in the warfare that accompanies many a home renovation. "The designer is usually expressing the wishes of the more style-conscious partner in a household," he says, "and if the electronics buff is the other partner, then a compromise has to be worked out. In many apartments and in houses as well, rooms often do double duty." Borenstein prides himself on being sensitive to both considerations. One way to avoid such problems is to work as often as possible with a trusted designer; indeed, some design professionals will bring in their own media installers at the beginning of a job. For example, Borenstein is the sound-and-light man of choice for some of the largest Architects and Interior Designers on the planet, like Peter Marino and Jamie Drake, a New York designer who is Michael Bloomberg’s Interior Designer. Of course, all this costs real money. According to Borenstein, the price to outfit each of the two apartments described above was between $30,000 and $40,000; most jobs range from $30,000 to $60,000. The cost comes not so much from the equipment, which is a large component of the expense when it is spread throughout a home--including outdoor spaces like pools or sundecks. But the real budget breaker is in the painstaking planning and design execution, especially when the systems are linked together invisibly. Precise plans must be drawn up for the location of all wires and cables throughout the installation area. Once the plans are finalized, the work must be carried out with great care behind walls and under floors of wood, plaster, stone, brick and tile. Naturally, then, it's best to install a system during a renovation or redecoration, not afterward. That way, the designer can be consulted at each step. 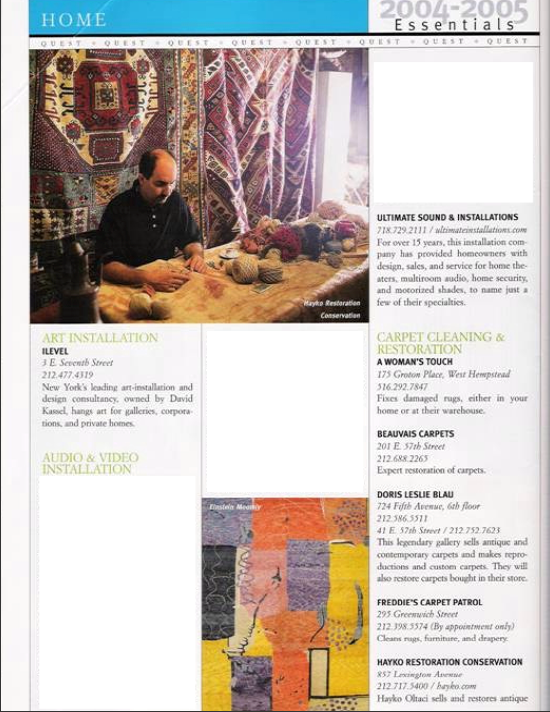 Installers like Borenstein find their clients through word of mouth, working with architects or designers who are familiar with their work. Of course, they are also referred by previous clients. But anyone installing a new media room should look at the work of the design professional before hiring them and always get a firsthand look at an installation they have completed. Ask previous clients if they are pleased with the work, which problems to anticipate and what they might have done differently. Once these systems are installed, it is costly to shift them around because of the labor involved in rewiring the room and then refinishing it. Borenstein started his firm 9 years ago when he noticed that "a lot of people weren't being properly treated by their local stereo stores," yet the stores were promising installation services. "They had no idea of construction, building codes, wiring and they were getting people the wrong stuff. It had nothing to do with custom installation." One specialty of Borenstein's business--remote keypads--are standard issue. However, that keypad may soon be obsolete, says Borenstein, who is providing some clients with a portable computer touchscreen that controls and commands the system. There is another conflict inherent in what Borenstein does: the audiophiles' delight versus clients who want foolproof operation of background sound throughout their homes. Borenstein recalls that when he first began designing and installing custom systems, he focused on providing the highest fidelity possible. Over time, he has learned how to balance that desire with the need for convenient operation and the demands of real-world hard-surface rooms. It hasn't been a terrible sacrifice, however. "There is generally one room where people do their primary listening. In that room we have a little more design latitude," says Borenstein--and a little more fun, because that's where he can really enjoy the challenge of creating an environmental poem. Borenstein says: "Nothing can really prepare you for the final day when, after you've installed a system, you're balancing it, tweaking it, listening to what the acoustics of the rooms are like. That's the most fun for me." Chances are that's when the fun begins for the hands that inherit the remote control, too.